that don’t get talked about in church. You can post a question below, or send me an email, if you don’t want your name linked to the question & I will post it for you, like I have done with this first one. ‘How am I to deal (externally and internally) with unloving, inconsiderate, unforgiving (basically unChrist-like) people who call themselves Christians?’ Simple answer I know-love them. I’m looking for guidance on the complex human answer. When/how to approach issues and when to just ignore them to develop their own consequences? How come so many believers are sick? I wondering how came we as believers are not able to be healed by the laying on of hands? I often struggle, as a feminist, with a book written by men. While I do believe the text is divinely inspired we can’t deny the cultural context. The paternalistic culture. My question is this… as a woman how do I tease out the message to which I must submit and the one I must resist? Am I failing as a Christian if I am not reading the bible or scripture daily ? 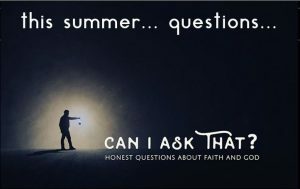 There have been a couple of questions raised about faith and science. Can & how do we hold both of them together? What about church… do we really need to be part of one?